The iconic first Bas-Lag novel from an award-winning author. The metropolis of New Crobuzon sprawls at the centre of its own bewildering world. Humans and mutants and arcane races throng the gloom beneath its chimneys, where the rivers are sluggish with unnatural effluent, and factories and foundries pound into the night. For more than a thousand years, the parliament and its brutal militia have ruled over a vast array of workers and artists, spies, magicians, junkies and whores. Now a stranger has come, with a pocketful of gold and an impossible demand, and inadvertently something unthinkable is released. As the city becomes gripped by an alien terror, the fate of millions depends on a clutch of outcasts on the run from lawmakers and crimelords alike. The urban nightscape becomes a hunting ground. Battles rage in the shadows of bizarre buildings. And a reckoning is due at the city's heart, under the vast chaotic vaults of Perdido Street Station. 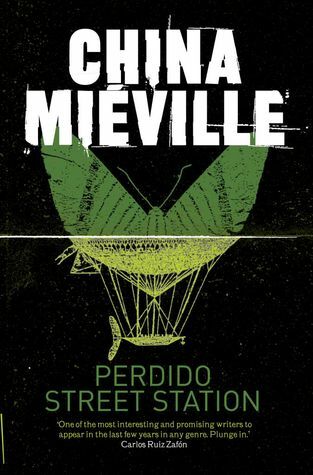 I had wanted to read Perdido Street Station for ages so I am pleased I can finally tick it off my list. It seemed to take forever to get through it but I loved every minute of it! It's a long book! In many ways, the world of Bas-Lag mirrored ours - different cultures/races living in close proximity of each other with prejudices towards the others; corrupt governments and conspiracies; poverty and homelessness; fundamentalists; crime lords and the criminal underworld; drug dealers and users; underpaid and exploited workers and the jobless - basically all the aspects of our world that we could do without! The city of New Crobuzon where this book is based didn't appeal to me at all. It is dark and uninviting and has no mercy on its inhabitants. That said, there are some very likeable characters living there including Lin, Isaac, Derkhan, Lemuel and Yagharek who are the main characters in this book. For all the similarities to our world, there were a whole host of differences too – steam powered engines, new technology and scientific theories, a plethora of alien races and animals to get your head around which made the world a very complex place to spend time. Don’t get me wrong, I loved it all, but because of the addition of all these alien things to me it took me time to read and digest the story. Although the world is complex and detailed, the story was much simpler so the two balanced themselves out somewhat I thought. Within the first 20 pages, I had to look up about 15 words which I’d never even heard of let alone know what they meant. This seemed to lessen as the book went on as many of the same words cropped up again. Plus I think I was just becoming more used to China Miéville's style of writing. I was left feeling a bit dirty after reading this book. I’m not sure how to explain it really. And unsettled. It was a dark tale and seedy too – perhaps that was why it made me feel like this. This isn't necessarily a bad thing though. I did love this book. How to describe this book?!? Dark and disturbing. Interesting and intriguing. Weird and Wonderful. I was really torn as to what to rate it - 4 or 5 stars. Decisions, decisions! I loved everything about it so by rights I should have given it 5 stars but because of the complexity of the world with all the descriptiveness (and it was very descriptive but that meant it was firmly fixed it in my mind) which made it a more difficult read for me, I decided to give it 4 stars (on Goodreads as they don't allow for half stars) but on here I give it 4.5 stars! I have already purchased the second in the Bas-Lag world, The Scar, which I'm hoping to read over the Summer - I just needed a vacation from Bas Lag for a bit before returning. I am quite intrigued about it as it is not set in the same city nor does it have the same characters in it. Looking forward to it!